Team this vibrant, dark green cabbage with hot horseradish for a perfect accompaniment to beef. 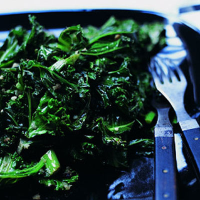 The horseradish brings out the flavour of the curly kale, making it utterly irresistible. Set a wok over a high heat – you may need to use two, depending on their size. Add the wet curly kale and cover with a tight-fitting lid. Cook for 5 minutes, stirring occasionally, until soft and tender. Add the butter and horseradish to the pan and toss through the curly kale. Season to taste and serve immediately. This vegetable dish is so quick to make that it’s worth preparing fresh, as the flavours will be far more vibrant.